© 2008 Kerstin Michler. Permission to redistribute is granted provided that this copyright notice is included. Sale of this instruction or using it commercially is not permitted. Yarn: Oddment or 25 g 4ply sock yarn. 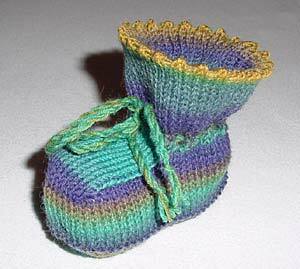 I used an oddment of self-patterning Opal sock yarn in purple-turquoise-gold colourway. Machine: Suitable for single-bed knitting machines with 4.5 mm needle spacing, optionally a garter carriage for the purl row (or hand-tool purl row). Pattern: plain knitting, tension setting about 7. Tension swatch: ca. 28 stitches and 40 rows per 10 cm, not critical. E-wrap cast on from left to right 47 stitches (23 left, 24 right of center 0). Set row counter to 000. Knit 1 R (carriage is at left), hang single-bed comb and small claw weights. Knit 1 more row and rehang stitches to outside so that one needle each at left and right of center needle is empty and the second needle on each side (counted from the outside) is empty, too; 4 empty needles altogether. Hang "heel loops" from stitches below onto these empty needles. This way you increase 4 stitches. This is a bit tedious, so work slowly! Knit 2 rows and repeat these increases 4 times until there are 67 stitches. The last increase is with RC showing 010. Knit 1 row, then work a purl row (with garter carriage or by reforming the stitches by hand) for the edge of the sole. Knit 12 more rows. Carriage at right, RC shows 024. Now continue knitting over needles 6 left to 7 right thus: Push both part buttons or set carriage to slip respectively. Pull a long thread from below the carriage and hold it down, it will be sewn in later. Push center 13 needles into e position. Knit to the left. Only the center 13 stitches have been knitted. 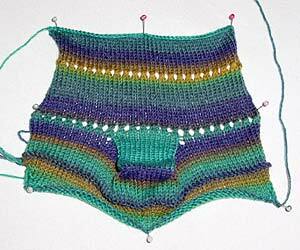 At the right side, hang all stitches that have not been knitted one stitch to the center so that there are now two stitches on needle right 7. Push empty needle at the right edge back to non working (A) position. Push 13 stitches from needle left 6 to needle right 7 to E position. Knit 1 row. At the left side, hang all stitches that have not been knitted one stitch to the center so that there are now two stitches on needle left 6. Push empty needle at the left edge back to non working (A) position. Push 13 stitches from needle left 6 to needle right 7 to E position. Knit 1 row. Repeat these two steps until there are 20 rows worked and the previously increased stitches have been decreased. 47 needles are in working position. Resume knitting over all stitches. Knit 2 rows. For the first row of holes, hang every second stitch onto the neighbouring needle, leaving empty needles in work. Knit 16 rows, repeat row of holes (for the top edge of booties), knit 13 more rows and cast off very loosely. The picture at right shows you how your piece of knitting looks when it comes off the machine. The "nose" in the center forms the front part of the bootie. Sew sides down from cast-off edge in mattress stitch and sew cast-on edge together as well. This seam forms the center of the sole. Fold upper part of leg at the upper row of holes down to the inside and slip stitch down loosely. Sew in all ends. Thread a cord (corded or i-cord, as you like it) through the lower row of holes and tie to form a bow. Work second bootie the same way as the first one. Back to top, to overview or to start page.